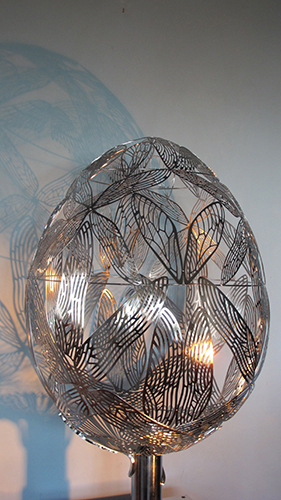 The interwoven 'shell' form of the egg form sculpture was created to reference regeneration and the life cycle, using multiple, filigreed and ephemeral wing components accumulated from my editioned artworks; Kingsteelii Uropetala, the Dragonfly series, the Piwakawaka, the Little Ruru, and the Cicada series. 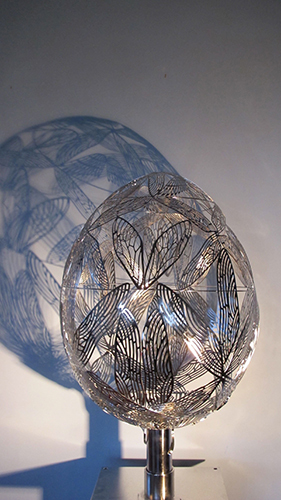 The components of 'wing and a prayer' were fitted and formed around a fibreglass egg 'pattern' provided to participating artists in the project, and assembled onto fine 4mm diameter bands of welding rod. 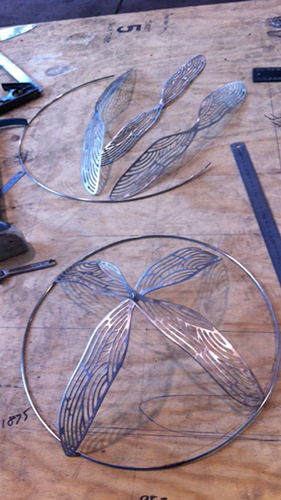 Each pair of wings was cut and reversed to balance the symmetry, then re-welded and the surface ground and refinished. As the delicate structure increased in strength, I was able to check its shape and accuracy by fitting the sections over the fibreglass 'pattern'. To strengthen the connection between the base support stand and the shell form, I used a pair lizard 'drop outs' 6mm thick, retrieved from the structural ribs of my Reed Vessel commission in Melbourne Docklands. Marine grade 316, stainless steel, laser cut and hand finished. The artwork was electropolished to achieve its glowing finish. Dimensions: Height 750mm x Diameter 550mm.